Beeson Divinity School’s M.Div. combines academic and practical training to prepare men and women for full-time ministry. Beeson Divinity School strives to prepare God-called men and women for faithful ministry in the church of Jesus Christ. We seek to accomplish this mission in keeping with the following convictions. We believe strongly that a community-oriented, full-time and personal environment offers the best opportunity to train for such ministry. We believe the Bible is God’s Word written and therefore fully trustworthy and able to teach us how to know our Lord and serve his people. We believe the truths expressed in historic confessions of the faith, such as the Apostles' Creed, the Nicene Creed, and significant denominational confessions. We believe that Jesus Christ alone saves from the penalty, power and presence of sin. We believe that ministers in the church of Jesus Christ, too, should proclaim and live by these convictions. 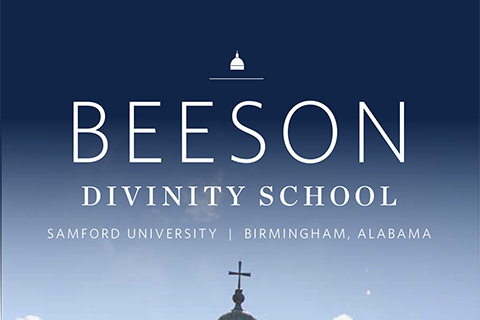 The Master of Divinity is the flagship degree of Beeson Divinity School. It combines academic and practical training to prepare students for full-time ministry. This degree offers a balanced curriculum of biblical studies, history and doctrine, spiritual formation and ministry leadership development. The M.Div. consists of 87 hours and typically requires three and a half to four years to complete. Demonstrate the ability to be able interpreters of the Scriptures in the preparation of expositions of the biblical text. 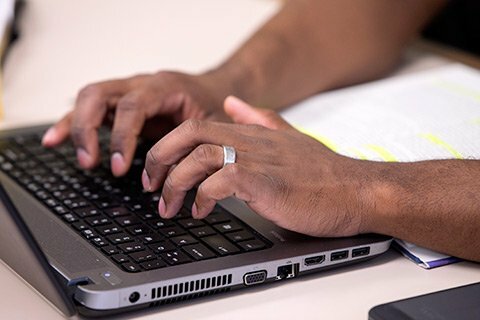 Demonstrate the ability to use relevant biblical, historical, ethical, and theological data and methodology to articulate key evangelical doctrines and their significance to the life and work of the church in denominational context. Demonstrate the understanding and disposition necessary for personal growth in Christlikeness, in vital relationship to the life and work of Christian ministry. Demonstrate the understanding and disposition necessary for faithful and elective gospel ministry in changing cultural contexts. Demonstrate the ability to prepare and deliver oral sermons that exhibit thorough exegetical and theological analysis of biblical texts in context, and that communicate the word of God clearly and persuasively. Demonstrate competency in the practice of the pastoral arts, as evidenced by a healthy understanding of pastoral vocation, a firm commitment to growth in pastoral identity and theological reflection, and love for God expressed through humble service to others for the sake of the gospel of Jesus Christ. At Beeson we strive for academic excellence to the glory of Jesus Christ. Above all things, we want to form men and women of God who will love and serve his church. We do this by teaching a classical, academically rigorous and ministry-focused curriculum. 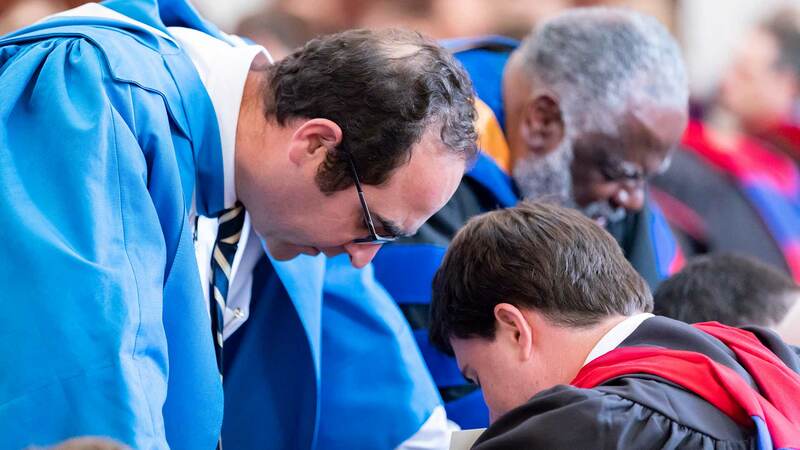 The Master of Divinity (87 credits) requires all students to follow a structured, sequenced curriculum of biblical languages and biblical theology, church history and doctrine, spiritual formation and missions, pastoral theology and preaching. Through this program you will learn to serve God’s people by studying and preaching the Bible, integrate the history and theology of the church throughout the centuries, and serve in local and cross-cultural ministry settings. Because we value face-to-face theological education in community, we expect all M.Div. students to follow this curriculum as full-time students. Beeson retains the evangelical conviction that Holy Scripture norms theology, life and ministry. Thus, students take courses in Old and New Testament Theology as well as four courses each in Greek and Hebrew. Unique in theological education, Beeson teaches theology and church history together in an integrated four-course sequence. Students learn key doctrines such as Scripture, Christology, Pneumatology, justification, creation, and anthropology as they unfold and develop in the history of the Christian church. At Beeson we believe that theological education should result in transformation, not only the transfer of information. We also believe that all theology must result in ministry for the church in the world to the glory of God. Thus, students take required courses in spiritual formation, pastoral care and counseling, evangelism, missions and preaching. Every M.Div. student also completes a year-long ministry practicum in a local church setting, as well as a cross-cultural ministry practicum. Students may take four courses in any of the three areas above to hone their preparation for ministry and complete the degree. All items on this checklist must be received by the application deadline. Further instruction is given on the online application. Church Endorsement (to be completed by the governing body of your church of membership). *This may be completed, if needed, by the same person who completes your pastoral recommendation form. However, please make the pastor aware he/she will need to complete both recommendation forms. Each applicant is responsible for scheduling an interview. Interviews must be completed prior to the application deadline. It is recommended that your interview be completed on campus, but if this is not possible, interviews conducted by phone or Skype are acceptable. Schedule your interview by contacting Sharon Head at shead@samford.edu. Or, an official electronic transcript can be emailed to: shead@samford.edu. A final transcript also is required upon completion of your undergraduate degree. Transcripts are considered official only when they bear the issuing institution's seal and arrive with the seal intact. The application process for international students is unique and can seem complicated. It is our hope that this page will reduce this stress by taking you step by step through the process. Prospective international students must complete and submit the following evaluations to the Beeson Divinity School Office of Admission before beginning the standard application process for admission. TOEFL (Test of English as a Foreign Language) Any applicant whose native language is not English must also submit a score of at least 550 (paper-based) or 80 (Internet-based) on the TOEFL. Students should arrange to take the TOEFL by visiting www.toefl.org or by writing to Educational Testing Service at P.O. Box 955, Princeton, NJ 08540. Once the above material is completed, an international prospect may begin the standard application process by clicking on the "Apply Now" button below. Following an admission decision, the applicant will need to complete the Affidavit of Financial Support, including an official bank statement. The USCIS (United States Citizenship and Immigration Services) requires proof of funds totaling approximately $30,000 (minus any scholarship assistance) in order for an I-20 to be processed, therefore it is recommended that funding is secured before the completion of the application process. *A note regarding student visas: The United States Information Agency's insurance regulations for J visa holders require international students and their dependents to have and maintain health insurance during residency in the United States. Proof of coverage is required before registering for classes. The law mandates that Samford University must deny student status to international students who do not continue to comply. Information about specific carriers, minimum coverages, and premium costs is available from Samford University Health Services. Please contact Jennifer Beck if you have any questions. The Certificate of Anglican Studies aims to help the student deepen in the knowledge of Anglican belief, practice, worship, and spirituality. This certificate is only awarded with the successful completion of the M.Div. degree through Beeson Divinity School. Certain courses completed within those degree programs also count towards the C.A.S and are outlined below. While students in the past have completed the M.A.T.S or the M.Div. and continued to the mission field, others have wanted more intentional training in cross-cultural ministry. For this reason we offer a missions certificate for students pursuing the M.Div. In addition to an excellent academic grounding in biblical and theological studies, missions certificate students will take 3 missions courses and 2 practicums. In concert, the classroom and field courses will provide a rich training ground for students pursuing a call to cross-cultural mission. "Introduction to Christian Missions" is part of the required core curriculum. Dr. David Parks, the director of the Global Center and overseer of the missions certificate, teaches this foundational course which provides a biblical, cultural, and strategic overview of God's global mission to all tongues, tribes, and nations. The other two missions courses fulfill 6 of the 12 elective credits for the M.Div. and will be taught by expert missions scholars. "Contemporary Issues and Strategies in Missions" will be taught by guest missions scholars. The second course, “World Religions,” introduces the classic texts in five of the major world religions and compares and contrasts these beliefs with the Triune God of the Bible. Taught by Dr. Gerald McDermott, this course explores contextualization and Christian witness in a multi-religious world. All M.Div. students must complete a two-week cross-cultural immersion experience overseen by the Global Center. Students earning a mission certificate must complete a minimum six-week cross-cultural immersion experience. Beeson has partners both in the U.S. and around the world with mentors who will oversee the students. Ministry partners are in such places as the Czech Republic, Liberia, Malaysia, Ecuador, Mexico, the Middle East, and Brooklyn. Missions certificate students will complete their Supervised Ministry Practicum in a ministry that is both cross-cultural and evangelistic in nature. It is a one-year training experience in the Birmingham area designed to provide real world training for missions. Joint-degree programs allow students to earn two degrees concurrently with fewer credit requirements than needed to earn the degrees separately. Joint-degree programs require separate admission applications to each of the respective schools. Students seeking to enter a joint-degree program must meet admission requirements for both schools participating in the joint program. Beeson Divinity School's primary degree is the Master of Divinity, and our student body is small. As such, our course work offerings are limited. Classes are offered during the day only, Tuesday through Friday. The curriculum structure is integrative and requires incremental progress from one semester to the next. Joint degree students are encouraged to plan their course work well in advance to minimize scheduling or sequencing conflicts. To receive divinity school scholarships, joint degree students are expected to take a minimum of nine divinity credit hours per semester. The M.Div./M.B.A. joint degree program, offered by Beeson Divinity School and Brock School of Business, allows students to pursue the M.Div. and M.B.A. degree concurrently. The program is designed to enrich the educational opportunities available to students in the separate disciplines by encouraging interdisciplinary approaches to ministry preparation and organizational problems that directly affect churches and other religious institutions. Students interested in this joint program should apply to Brock School of Business for admission into the M.B.A. program at the conclusion of the first year of the M.Div. program. The M.Div/M.M. joint degree program combines work in Beeson Divinity School and the Samford University School of the Arts. Students must apply to both schools separately for admission. The M.Div/J.D. degree program combines work in Beeson Divinity School and The Cumberland School of Law. The program takes approximately six years to complete. Students must apply for admission to each school separately. They must complete their first semester of law school before applying to the divinity school. Law students applying to the dual degree program must maintain at least a 2.5 grade point average. The M.Div./M.S.W.. degree program combines work in Beeson Divinity School and The School of Public Health. The program will equip students with the knowledge and skills necessary for preaching and mercy ministries in the local church and in cultures vastly different from their own. Students in the program will choose a concentration in either clinical social work or global community development for the social work portion of their studies. The total number of required credit hours for the M.Div./M.S.W.. is 135. Students must apply for admission to each school separately. Does Beeson grant Advanced Standing? Students who have taken undergraduate courses that parallel or intersect with Divinity School courses may be granted Advanced Standing for those relevant courses. Students are not given credit for courses taken previously. Rather, they may take advanced courses in the specific areas in which they are granted Advanced Standing. For instance, a student who is given Advanced Standing for DVNT511 and DVNT 512 will be required to take six credits of electives in DVNT Greek exegesis courses. To learn more about advanced standing, email Jenn Daniel at jdaniel3samford.edu or call 205-726-4485. Does Beeson prepare students for Ph.D. work? The M.Div. includes two full years of biblical languages, thus allowing graduates to teach in more than one biblical and linguistic content area. The M.Div. requires more history and doctrine courses, thereby equipping students for the broad swath of classes they will have to teach in Christian college or seminary. The M.Div. requires students to learn about counseling, which is a big part of seminary and college teaching and advising. The M.Div. requires students to learn about administration and how to apply administrative principles, thus preparing students to serve in the many administrative and committee capacities that occur in academic settings. The M.Div. requires preaching, which most teachers have to do to fulfill their calling as ministers of the gospel. The M.Div. requires students to have mentored experiences in ministry, thereby preparing students for the sort of accountability structures that are a major part of academic work. The M.Div. requires students to take a cross-cultural course that gives international experience in a monitored environment, thereby preparing students for the global context in which education occurs now. The M.Div. requires students to take electives that will fill out the basic content of their major field of interest. Does Beeson offer online classes? Beeson does not offer any online or distance learning. All classes are in the traditional classroom setting.